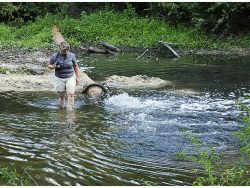 In this photo from July 2011, then Ogeechee Riverkeeper Dianna Weddincamp investigates discharge from King America Finishing plant pipe on the Ogeechee River. About halfway through a three-year project studying the Ogeechee River, Georgia Southern University researchers and their partners offered an update on their progress during a public forum Tuesday evening at the university. The project still has a lot of work to be done, and researchers did not divulge any information about current river conditions except that the drought is over, with more than 45 inches of rainfall in the area since January. “At this point, we don’t have a lot of concrete conclusions or trending information,” said Dr. Jeffrey Underwood, chairman of GS’s Department of Geology and Geography. The project is a Supplemental Environmental Program and was mandated as part of an enforcement action taken by the Georgia Environmental Protection Division in response to violations of the Georgia Water Quality Control Act by King America Finishing, a textiles plant located on the river near Dover and Cooperville, communities in Screven County. The program is overseen by Georgia’s EPD and funded by Milliken, a textiles company that bought King America. King was targeted following a massive fish kill in 2011 that killed about 38,000 fish. Investigations determined that columnaris, a bacterial disease caused by stress, was the cause — and many charged that the stress was caused by pollutants in the river that came from King. The fish kill began just downstream from the King America plant and spread for miles. The project involves the lower Ogeechee River and the flood plain near Oliver. The project is meant to provide more than short-term monitoring of biogeochemical components in the river basin and to ensure a long-term approach for research conducted on the Ogeechee River, according to the site. Two teams and partners are involved in the study. A group from GS’s Department of Geology and Geography focuses on atmospheric and terrestrial processes in the watershed, while the other, from GS’s Department of Biology in conjunction with the Southeastern Natural Sciences Academy, targets the in-stream processes and biological communities of the river. The study examines every aspect of the river and its environmental impact, Underwood said. “We trace the water from the sky as it makes its way to the stream channel,” he said. Several GS professors spoke about the project, explaining steps taken by the teams to study the river and monitor its condition. Dr. John Van Stan explained how rainfall travels through the tree canopy and down the trunks and either evaporates, is absorbed or travels to the ground, where it is filtered through litter (leaves and plant matter) before it enters the ground and eventually seeps into the stream flow. There are three international scholars collaborating at the site, and the project has been awarded a national science grant. “This has been a lot of work and a lot of fun, too,” Van Stan said. Dr. James Reichard spoke about aquifers and how they work and said groundwater moves a foot a day at its fastest. Dr. Jaque Kelly shared how her team is using radon to track groundwater. She said radon occurs naturally through the breakdown of uranium and that the river levels are “way below” the level accepted by the EPD. Dr. Oscar Flite shared how chemistry samples are taken at various testing sites along the river to monitor things such as dissolved oxygen and bacterial activity. A type of bacteria that emits light is used to test the water samples, said Dr. Risa Cohen. If the bacteria stops emitting light, this indicates toxicity, she said. Others spoke about various aspects of the project, including the collection of fish, some of which are released back into the river and some that are used to study tissue samples.